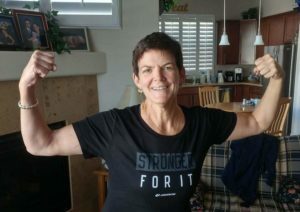 Donna earned her “stronger for it” shirt for attending 150 Jazzercise classes in 2017. At age 14, Donna Spearman had a stainless steel Harrington rod implanted along her spinal column to treat scoliosis. At that time, her spine’s 60 degree curvature was progressing rapidly. During the procedure, a major portion of her spine was fused, and she was left with only two functioning lumbar discs at the base of her spine. 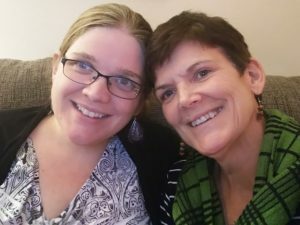 Donna Spearman and daughter Emily have both enjoyed full and active lives since scoliosis-related spine surgery by Dr. Janssen. Donna went to see her primary care physician, Dr. James Yeash, who referred her to Dr. Michael Janssen, a spine surgeon at the Center for Spine and Orthopedics. “Dr. Yeash told me that Dr. Janssen was the person who could help me,” says Donna. She saw Dr. Janssen and had x-rays taken of her spine. During a 14-hour surgery, Donna’s mother kept a written log of the hourly communications from the operating room to family and friends in the waiting room, while Dr. Yeash scrubbed in for support. Ten hours into the operation, Dr. Janssen took an x-ray and determined that the alignment was not exactly as he wanted, so he operated four more hours to make sure that it was perfect. After her recovery, Donna returned to the activities that she enjoys most, except for running and skiing. “It wasn’t worth the risk of falling and losing my mobility,” she explains. Instead, she walks at a fast pace—around four miles an hour – hikes more and does Jazzercise daily, along with weight lifting. She and her husband, Steve, travel all over the world—Wales, England, Scandinavia, Switzerland, the Caribbean and more. She even took up snorkeling. Each December, Donna Spearman hangs the Harrington rod that Dr. Janssen removed from her spine on her Christmas tree as a reminder of her journey. 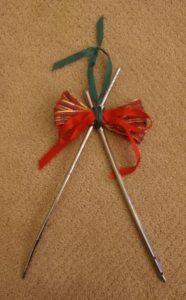 As a reminder of her journey, she hangs her Harrington rod, decorated with a red bow, upon her Christmas tree each year. “As I hang that ornament on the tree, I am reminded of Dr. Janssen’s important contributions to my life—the ability to stand tall, move easily, stay fit, carry my grandchildren, pursue worldwide adventures and much more, all without pain,” says Donna. And although she didn’t know it that first Christmas, Dr. Janssen would also enable Donna’s daughter to live a full life, too, unhampered by the detrimental effects of scoliosis. 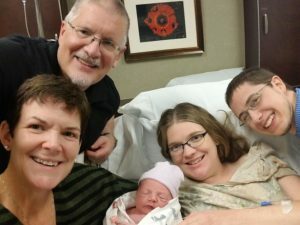 Donna celebrates the arrival of Emily’s second child, Iris Eileen. Pictured with mother and daughters are Donna’s husband, Steve, and Emily’s husband, Stephen. In 2003, when Emily was 15, Dr. Janssen performed a spinal fusion to correct her curvature. Since then, she has been pain-free. She is a mother to an active two year-old and a newborn daughter who arrived on December 30. In addition to being a mother, Emily also serves as a United Methodist pastor in Nebraska. In 2009, Donna returned to see Dr. Janssen after falling on her icy driveway while taking out the trash. She had injured two discs in her neck. Dr. Janssen performed a cervical fusion to relieve the pain and restore her arm’s function, which had been lost as a result of her neck injury. CLICK HERE to read Donna’s Letter to Dr. Janssen. For an appointment with Dr. Janssen, call the Center for Spine and Orthopedics at 303-287-2800. Scoliosis, or curvature of the spine, affects 2 to 3 percent of Americans, totaling about 6 million people. The condition most often appears between ages 10 and 15 and affects about 10 percent of all adolescents; only about 1 percent require treatment. Between 1964 and 2000, the standard treatment for scoliosis was fusion of the vertebrae in the curved part of the spine and placement of a stainless steel rod, called a Harrington rod, which attached to the vertebrae to allow the fused spine to heal. Complications, such as Flat Back Syndrome, can occur after Harrington rod placement. Normally, the lower part of the spine, called the lumbar spine, curves inward, a condition known as lordosis. Placement of a Harrington rod that extends to the lower spine can cause flat-back syndrome, in which the lumbar spine no longer curves inward but flattens or even bulges outward, a condition called lumbar kyphosis. About 40 percent of patients with Harrington rods develop flat-back syndrome. Symptoms include back pain and an inability to stand up straight. People with flat-back syndrome may lean forward or lose hip flexibility. Surgery to repair flat-back syndrome is complex and symptoms may persist after surgery. Not placing rods in the lumbar spine and using segmented devices rather than a single rod has reduced the incidence in recent years, the National Scoliosis Foundation states.